I’m not sure if my old cat would have taken kindly to this one. It’s called a Pet Spa, and you just pop your beloved pet inside and it cleans, de-fleas and then blow dries in a cycle that lasts 25 to 30 minutes. There’s quite a lot of technology to this gizmo though. 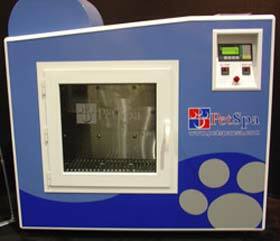 Doses of chemicals and shampoos are regulated, and the temperature of the water and air dryer is carefully monitored. Any more than 3 degrees and the cycle is stopped to avoid distressing or harming your pet. There’s just one slight problem I can see. My cat would have gone ballistic if I tried rinse and blow dry her in one of these. She was a British Blue Cream, and they’re quite famous for being neurotic and hysterical. Maybe I could have got her in the box once, but never again without shooting her with a tranquiliser gun first. I think any dog would love a spell in this though; they’re smarter or dumber, depending on your perspective – but for cats I think you can forget it in my opinion! The Pet Spa is available from Pet Gadgets (but I couldn’t find a price). Reading about the pet spa caused me to flash back to many years ago when my sister went through an automatic car wash with her small child in the car with her, in a car seat. It really traumatized the kid and I have to believe that a pet, even a large one, would suffer the same stress if put into such a device. youtube.com/watch?v=15bwhVxw-Bg shows a cat getting washed in this thing. The animal is not restrained inside this device, nor is there any way to keep the chemicals from getting into its eyes, mouth, or ears (which are health risks). The animal is placed inside, then subjected to jets of water shooting at it from the floor. The cat frantically tries to jump out of the way of the chemical-laden water, tries to break through the glass door to safety, slams its body against the walls…I cried when watching this, and wondered how anyone could subject an animal to this type of cruelty. A healthy cat does not need to be bathed. If, for some reason, you must clean his coat, there are dry coat cleaners that are cheap to buy.